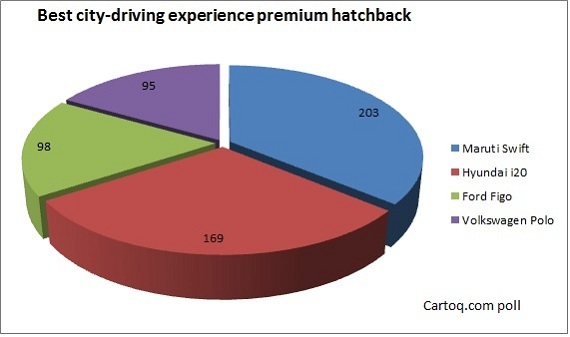 In a CarToq.com poll to identify which premium hatchback offers the best city-driving experience, the Maruti Swift has emerged as the clear winner against the top four premium hatches in overall sales, which include the Hyundai i20, Ford Figo and Volkswagen Polo. Among the 565 votes polled, nearly 36% voted for the Swift as the premium hatchback that offers the best city driving experience, while the Hyundai i20 came a close second getting nearly 30% of the votes. The Ford Figo, which had emerged as the best-handling diesel hatchback in an earlier CarToq.com poll, got only 17% of the votes when it came to overall city-driving experience, while the Polo came in fourth, just a few points behind the Figo. The Swift got the most votes because of its overall drivability in the city. This vote was not limited to only petrol or diesel, but covered both types of cars. The petrol Swift has the most powerful engine in its class, putting out 86 bhp of power and 114 Nm of torque from its 1.2 litre engine. The light clutch, instant accelerator response and nimble, precise steering of the Swift make it confidence- inspiring to drive in city traffic. The sheer number of Swifts being sold each month and that are visible on city streets is testimony to this. The other big factor that probably swung the vote in favour of the Swift is that in both petrol and diesel form, the car offers the best mileage in city conditions. Petrol Swifts are known to give about 13.5 kmpl in city traffic, while diesel Swifts can give 18 kmpl in crowded city conditions. What makes a car a good one to drive in the city? One must consider the kind of traffic conditions and the roads that you will negotiate. City traffic calls for plenty of bumper-to-bumper traffic, which can lead to excessive use of the clutch. A car that has a light clutch will not tire you out. Similarly, a car that offers a light, easy steering that’s precise and easy to use at low speeds is an advantage. Brakes need to be sharp. All-round visibility has to be good, with a good view of the road and traffic following. In hot climate conditions, the air conditioner needs to be really efficient. Taking all these factors into consideration, the Maruti Swift offers the best overall mix, and hence was seen as the winner. The Hyundai i20, which came in second, is popular because of the convenience features such as Bluetooth, reverse camera and parking sensors that it offers – all factors that add to a good city driving experience. The Ford Figo has great handling, but isn’t as peppy. It also has some issues with ground clearance when loaded, especially in cities that have mammoth sized speed breakers! The Polo is a great car to drive, but does not seem to be as popular among the CarToq community who voted.